Fishing in Murchison falls is done mainly as a sport and is among the main activities along the Nile. It involves catching fish by casting lures; this method is used for catching larger fish species like the Nile perch and some cat fish. There other method used for catching fish is the use of live bait like worms, termites to catch smaller fish species like the Tiger fish, also you can catch them using the spinning method. There are two major fishing sites in Murchison; one near Paraa(located below the Murchison falls) and another below Karuma falls(at Chobe safari lodge). But sport fishing in the park is currently carried out mainly at the base of the falls either from the boat down the stream or from the rocks on the River bank. Accessing the fishing spots can either be by boat or by walking down from the top of the falls to the gorge which can take 45 minutes for a physically fit person. With this you are recommended to move well equipped with your fishing equipment.As you enjoy catching fish there is always a chance to land on a huge catch; in terms of length, weight and girth. 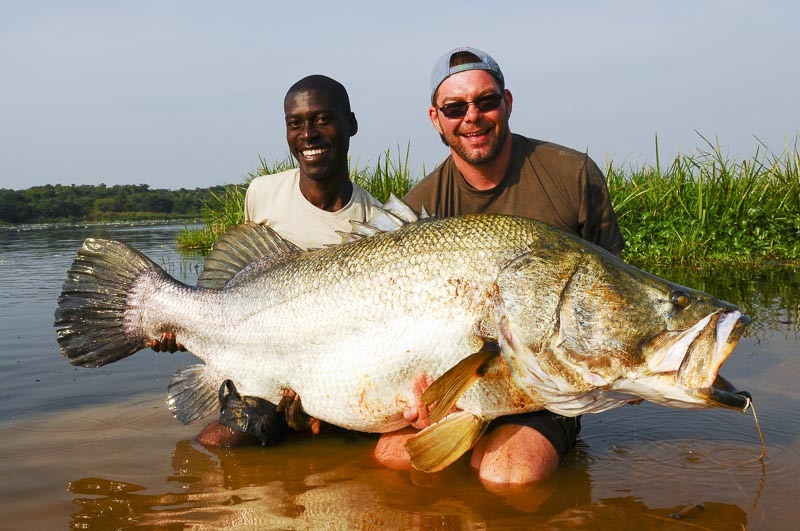 In fact record has it that the heaviest fish caught was 113kg and this was a Nile Perch. Murchison Falls National Park is found in the Northwest of Uganda approximately a 6hours drive from Kampala (looking at the traffic in Kampala and a few tarred roads that lead to the park). Note that the roads in the park are Murrum, hence advised to drive in a 4 x 4 vehicle; spacious and comfortable for you and also with room for your fishing equipment. You could also take a flight to the park chartered from the Entebbe airport or Kajjansi airstrip since the park has airfields like Pakuba airfield. This makes the distance shorter! Fishing in Murchison can be done anytime of the year and the large catfish and Nile perch can be caught all through. Anglers say that best catches are seen early in the morning and late in the day. Though best results of fish are when the water level is low since water is clearer, i.e from Mid-January to Early-April. Also it is said that fish feed more when weather conditions vary dramatically especially at the start of the rainstorms. As you catch fish you are also surrounded with great sceneries the landscape and also wildlife such as hippos, crocodiles, elephants, waterbucks as well as beautiful birds.You are advised to carry enough sun protection equipment since the temperature can rise over 40°C. Also wear long socks, long sleeved trousersand insect repellents that can be used just in case of tsetse fly bites.Sport fishing requires expertise;therefore you need assistance from our experienced and skilled fishing guides! As earlier mentioned that you need to carry your fishing equipment and keep in mind all fish caught is not killed it’s laid back in the water alive. Methods are by casting lures, spinning and catching fish on live bait and fish species caught include; Nile perch, Catfish, Tiger fish among others. All anglers are advised to have rods that are between 8feet and 11feet with a multiplier reel. While catching smaller species; a 7’ spinning rod is recommended. This 3 days fishing safari will start from and end in Kampala, it involves a visit to Uganda’s oldest and largest national park -Murchison Falls National Park. It is home to over 76 mammal species, 451 bird species, fish species, and the mighty Murchison falls that have their way through an 8 meter wide gorge falling from a 45m high rift valley wall. Fishing will be the main activity, though you could have other activities like Game drives and Hiking to the top of the magnificent falls. A 4×4 vehicle will be used such that there is room for packing fishing equipment. Expect to have a catch of over 50kg! After breakfast, your driver will pick you up from Kampala and start off the 6hours drive to Murchison falls through amazing landscapes. Have lunch in Masindi and continue to the park. Upon arrival, head to the base of the falls and enjoy fishing the whole afternoon- this takes around 3 hours. You will be over joyed with the big catch of the Nile perch in the dramatic pools at the base of the falls. After head to the lodge, have dinner and an overnight. After a tasty breakfast, go fishing by boatalong the Nile River at the base of the magnificent Murchison falls, here you can catch Nile perch, catfish among other species. On this day you will spend the whole day catching fish or do it half day and go for a hike to the top of the mighty falls; this is a memorable experience. While on this boat you will also enjoy viewing the vegetation and wildlife found in the park such as the hippos, elephants, buffaloes, Nile crocodiles, birds among others. Have breakfast, after go for a game drive through the park where you will have chance to see a number of animals like lions, buffaloes, antelopes, waterbucks, warthogs, elephants among others. After the game drive, proceed to Kampala with lunch along the way arriving in the late afternoon. If your flight is on that same day, you will be transferred to the airport in Entebbe! Inclusions; Park entry, boat cruise, ranger guide, sport fishing permit, transport, accommodation, all en route meals.